Drinking and driving may be at its lowest level since West Hollywood became a city. That is according to a new report by WeHo by the Numbers, using data from the city, state and federal governments. Driving while intoxicated cannot be measured directly, so the report analyzes two proxies instead. One is arrests for driving under the influence (DUI). The other is collisions in which a driver was drinking. Both measures rely on investigations and reporting by the Sheriff’s Department. Over the last three decades, the number of DUI arrests has plummeted 92%. It went from over 660 in 1986 to about 50 in 2017, from two arrests a day to one a week. That is the lowest level of any year since West Hollywood became a city in 1984. The countywide trend generally mirrored that of West Hollywood through 2001, but the city’s numbers have dropped more than the county’s since then. 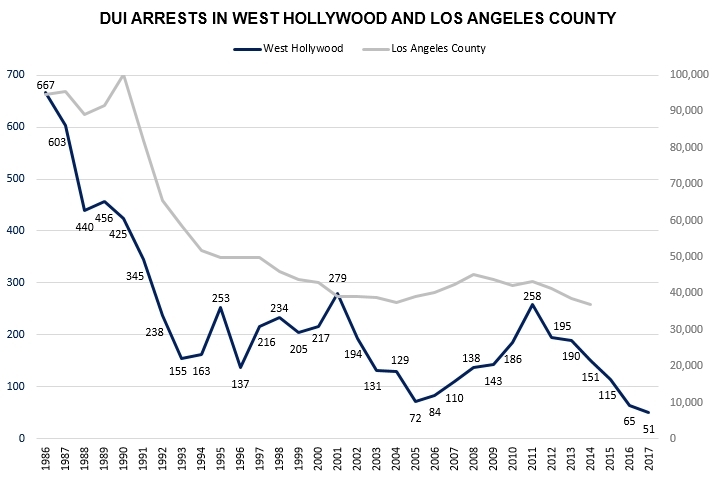 Although West Hollywood’s overall DUI arrest trend is downward, the number has gone through up-and-down cycles. It peaked most recently at over 250 in 2011. Since then, it has dropped back down 80%. The report includes two sets of collision numbers for drinking and driving. Both show a big downward trend in recent years. 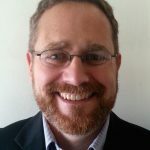 The broader set of numbers includes all collisions in which a driver had been drinking, regardless of the level of inebriation or the cause of the collision. Those drinking and driving collisions dropped 75% in the last five years. The number went from roughly 240 in 2012 to about 60 in 2017. The new level is well below the level in every other year since 2001. The narrower set of numbers focuses on incidents in which a driver was legally drunk and that was the primary factor in the collision. That number fell 70% in the last five years. It went from almost 85 in 2012 to 25 in 2017. The report notes that the collision numbers seem to follow an up-and-down cycle similar to DUI arrests. Both collisions and arrests reached recent highs around 2012 and lows in 2017. The report also includes an analysis of the share of collisions attributed to driving while intoxicated. In the last three years, 11% of all reported collisions involved drinking and driving. Alcohol was the primary collision factor in a third of those incidents, or 4% overall. Half of the drinking & driving collisions happened late at night or early in the morning. They represented a quarter of all late-night/early-morning collisions. For more information, see the full report, Is drinking and driving trending up or down in West Hollywood? LYFT and UBER for sure, PLUS Tinder and Grindr. More people are staying at home and not going to bars. Fact of the matter is, bars are suffering financially. For many reasons! Who wants to go to a gay bar with the possibility of running into straight friends out partying, that one is not OUT to them yet!!! I’m sure there are many GLBT folks not interested in that situation! Deane. I definitely agree it’s you there. As annoying as ride sharing drivers can be, these companies have fundamentally changed the the way people get around when going out for drinks. Now if only they offered decent service for the disabled community. They should adhere to the same standards as traditional transportation providers. Even if they have to purchase these vehicles themselves. These are the people who can most benefit rom eaasy access to transportation services. I don’t know why this report and this article do not mention that most likely the main contributing factor to this is the incredibly high use of ride share companies like UBER and Lyft that have been growing at leaps and bounds since there inception a little over five years ago.